Transport to and from the School is an important issue for our parents and pupils, the majority of whom live more than 5km away. The School has taken a proactive approach in this area; we are committed to providing sustainable travel and offering parents and pupils a range of transport options. A small number of pupils and a regular group of staff cycle to school each day. We are able to provide covered cycle storage and were fortunate to obtain a grant of matched funding from Sustrans providing additional storage. A number of parents choose to drop their daughters off on their way to work in the morning and use a bus service in the afternoon. We are able to help parents who wish to car-share, either in the morning or the afternoon. Parents dropping and collecting their daughter by car are requested to arrange to do so at a safe distance from the School and avoid picking up or dropping off on the zig-zag or double yellow lines or parking opposite the School gates or in front of neighbours’ gateways. 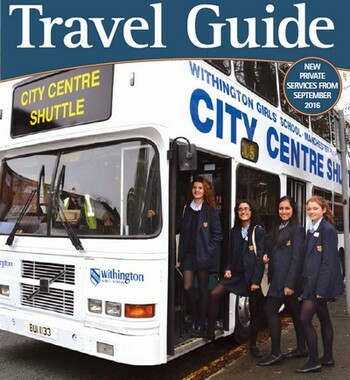 Withington Girls’ School and Manchester High School for Girls together run a SHUTTLE BUS service, connecting both schools with the major travel links into Manchester. This service is open to any pupil at either school and costs just £1 per journey. Alternatively, a termly ticket can be purchased from School. 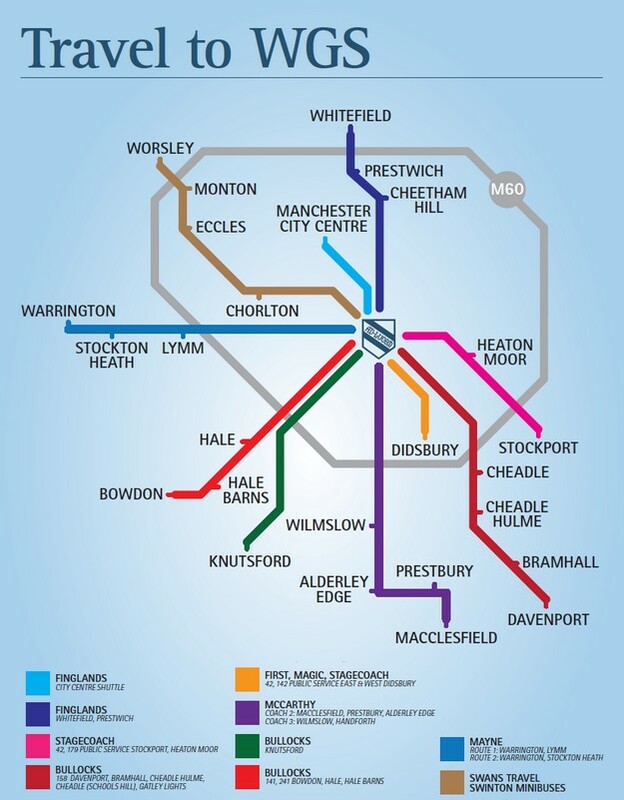 Whether your daughter travels into Manchester by train or tram, or you work in the city centre and would find it more convenient to drop your daughter off at one of Manchester’s mainline stations, this could be the perfect service for you. Many girls come in from places such as Bolton, Bury, Whitefield and Warrington and connect with the Shuttle with the greatest of ease. The Shuttle bus then drops them directly at the School gates. It is a flexible service and girls can either pay £1 per journey (on the day) or parents can buy a termly pass. We hope that these times will connect well with trains/trams and the second service will assist girls if an incoming train/tram is late. This includes the 141, 241 and 158 as well as the Knutsford, Prestwich and Whitefield services. This a privately-run service by Bullocks Coaches. The service is shared with Manchester High School for Girls. Parents need to buy a termly or annual pass. To obtain further information please call Bullocks on 0161 428 5265. The School will continue to offer a Late Service (at 5.15 pm) from Monday to Thursday. This service will pick girls up at the front of School and will take part of the 158 route (to John Lewis) before going on to Bowdon. Girls who have an annual pass will be able to use the Late Service for no additional charge. Ad-hoc use of the late bus will also be possible on purchase of a ticket (£3) from Reception. This is a privately run service by Bullocks Coaches. The services will be shared with Manchester High School for Girls and 50-seater coaches (with seat-belts) have been assigned to these routes. Parents will need to buy a termly or annual pass. To obtain further information please call Bullocks on 0161 428 5265. Please note that the cost of the supervisor is paid separately to the administrator of this service. There is a Late Service (at 5.15 pm) from Monday to Thursday on the 158/141 service. This service will pick girls up at the front of School and will take part of the 158 route (to John Lewis) before going on to Bowdon. Girls who have an annual pass will be able to use the Late Service for no additional charge. Ad-hoc use of the late bus will also be possible on purchase of a ticket (£3) from Reception. • The former public bus 149 route is now operated as a private service by Finglands Coachways and serves WGS, MGS and MHSG. Places are available by application and will be allocated on a first come first served basis.